Here's another small app that I created to play around with some code, but mostly because I felt I had a need for it. 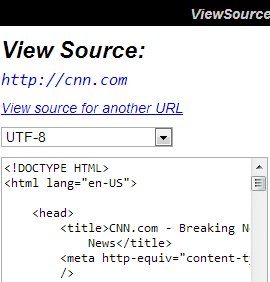 ViewSource is an app for viewing the HTML-source of any website from your web-browser. Which enables you to view source from mobile browsers. You can quickly reach the app through bit.ly/vsource. As always, the source is available on GitHub for forking. The application is an ASP.NET MVC-app, using Justin Etheredge's framework for minification called SquishIt. The app also uses ASP.NET Web API together with some simple jQuery to display the results of the minifications without any page-reloads. * At the moment of writing this post, Google Closure is not working as expected, but should hopefully work soon. Enjoy it at squishify.apphb.com and fork it on GitHub. Since I'm attending DevSum 2012 at the end of this month, I felt I needed to keep track of which talks to attend... but also the need to play around with some web-technologies. From those needs I took some evening hours to build DevSum Scheduler. It's a web-app that allows you to highlight which talks you're going to attend. The app uses HTML Agility Pack to get the data from DevSum's own website and then ASP.NET MVC Razor to display the content properly. To store this I've used HTML 5 LocalStorage to persist the choices made. There are many other technologies used, which are listed on the about-page. Since the website is suppose to help the attendees by being available on their smart-phones, I've used CSS Media Queries for mobile layout and Modernizr for feature-detection in the web-browser. Check out the full source-code on GitHub. Again, the outstanding AppHarbour has been used to quickly get the app on the Internet (through a GitHub-service hook of course). HtmlEncoder is a web-application built on ASP.NET MVC 4, source-controlled on GitHub, deployed on AppHarbor. GitHub allows you to directly deploy to AppHarbor on checkin/push to the Git-repository, which is a very powerful and useful feature, to quickly get your ASP.NET web-apps online in the cloud. It started out with a need to encode strings for HTML and developed into a quick test of how Web API on MVC 4 works in an AJAX-enabled web-app. Try it out at http://htmlencoder.apphb.com and fork it on GitHub.